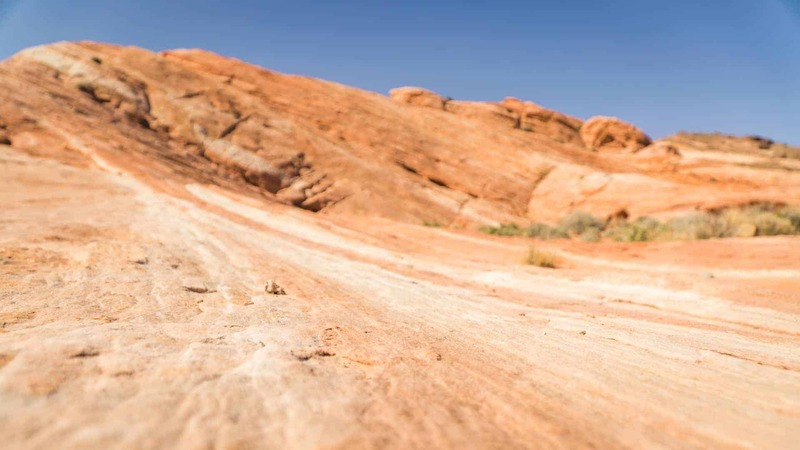 Less than an hour outside of Las Vegas, Nevada, Valley of Fire State Park is a gorgeous day trip adventure. If you have more time to explore the park, there is camping at the state park as well. Finishing up our winter galavanting around ski resorts, we left Mammoth California and started our journey east toward Oklahoma. Having just a week and a half-and needing to make stops in Salt Lake City and Denver-we didn't have a ton of time to explore. That tends to be the way of things when we head toward Oklahoma. Our plan was to head straight to Escalante Utah, where we have fallen in love with the wild area. However, just an hour outside of Las Vegas, a road sign caught our eye: Valley of Fire State Park. 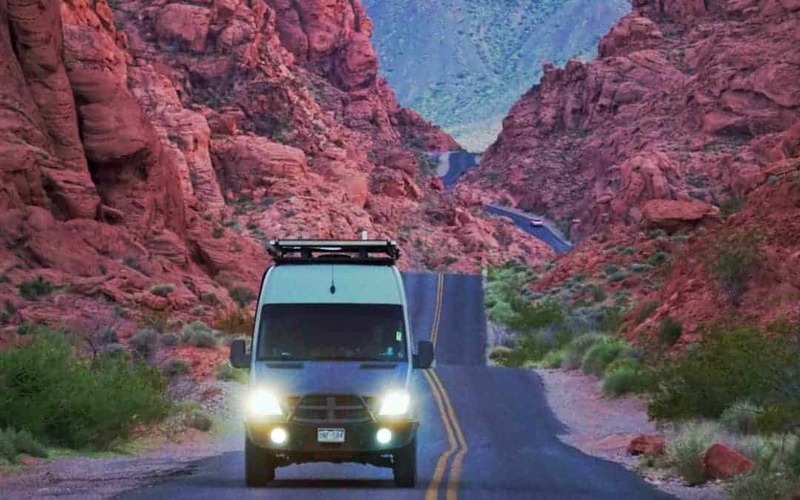 While we'd heard of Valley of Fire State Park and seen the stunning photos of it on Instagram, we'd never been there or even really had it on our radar. So, honestly, neither of us knew it was even on our route! 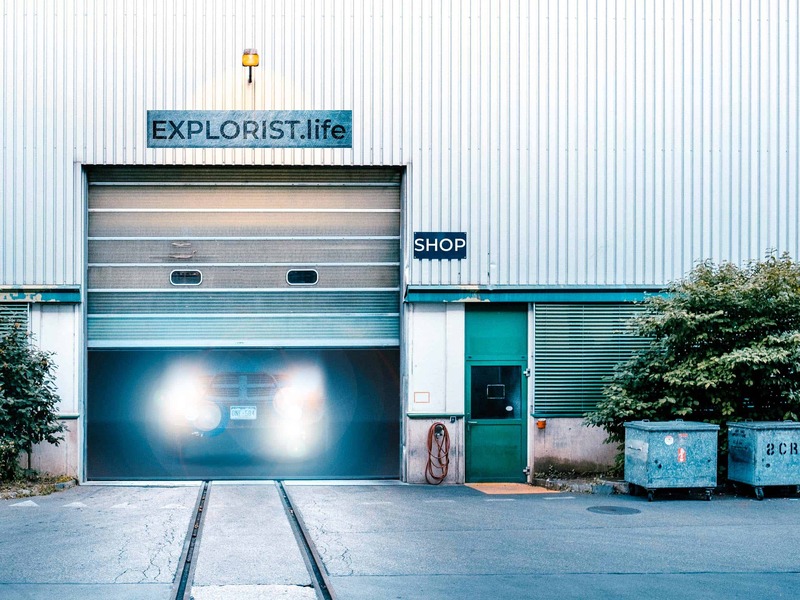 This year, we are trying to be more flexible with our routes, allowing for more detours on a whim. With that in mind, we took the exit toward Valley of Fire State Park. Escalante will be there whenever we get there. 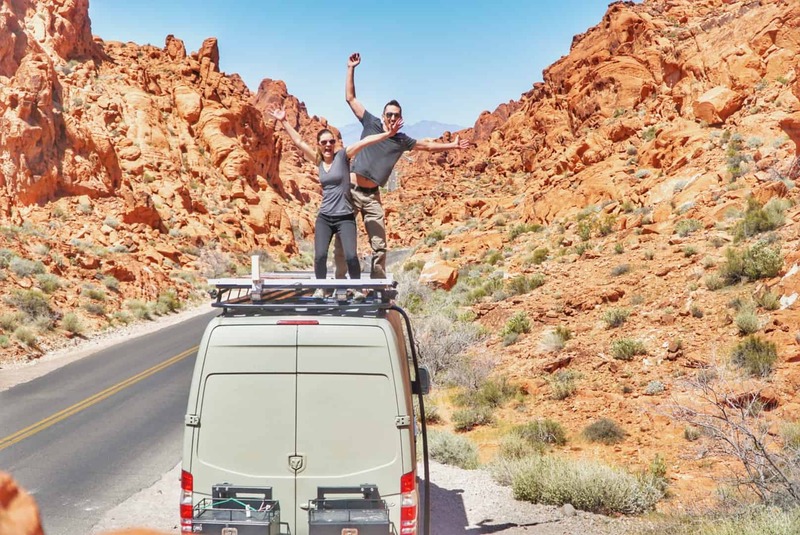 We had just one day to explore Valley of Fire State Park, and we explored quite a bit for just a one day trip. 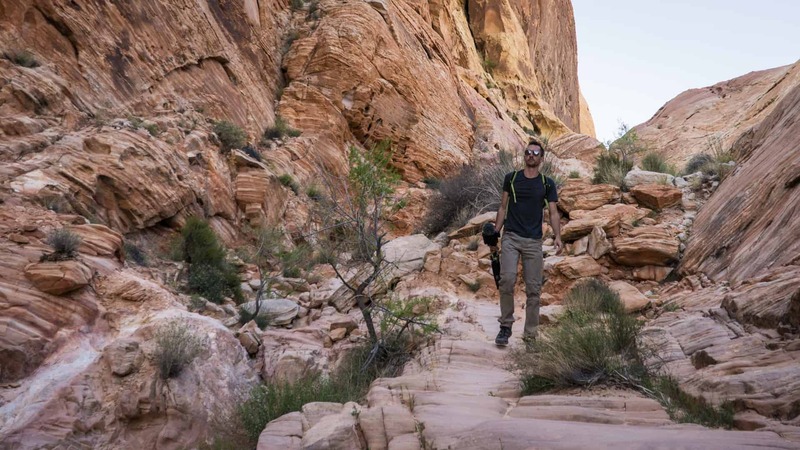 This would be a fantastic day trip from Las Vegas if you are visiting the city and want to explore nature a bit as well. Although the signs said that the campgrounds were full, we went ahead and asked the ranger at the entrance if there were campsites available. To our surprise, he said there actually were! Our first order of business was to secure our spot for the night in the Arch Rock Campground. This is a nice primitive campground with no hookups but does have pit toilets as well as picnic tables and water spigots. 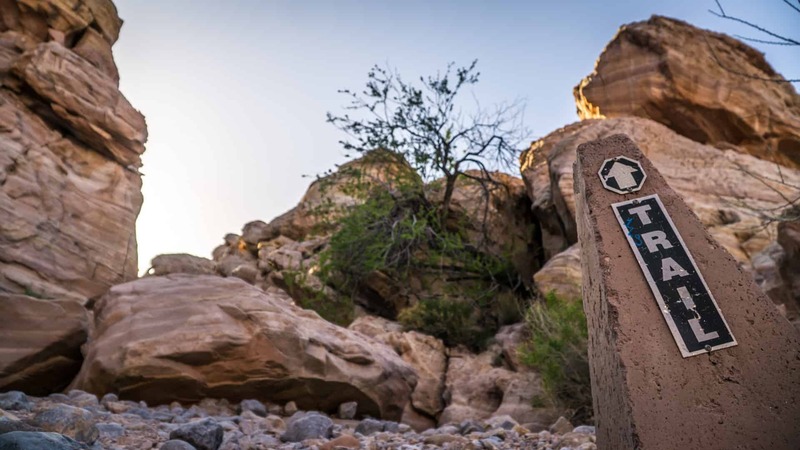 There is another campground on the same road, the Atlatl Rock Campground, that has RV hookups as well as shower facilities. 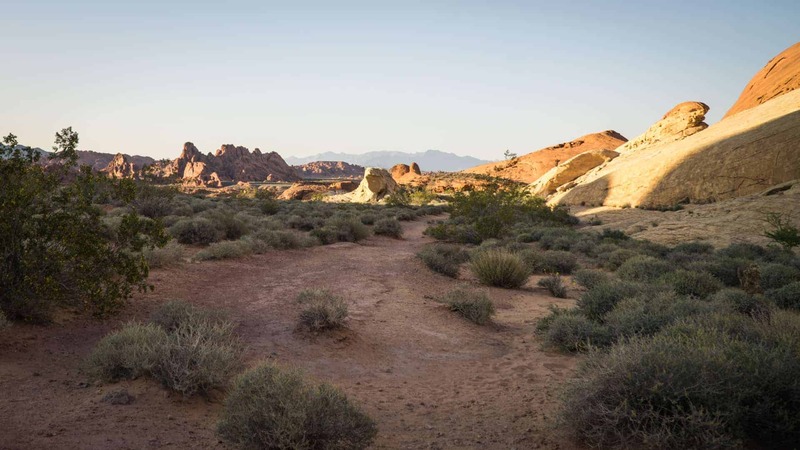 Alternatively, the park is surrounded by BLM Land that offers free camping (with no amenities). We needed to refill on water, so we opted to pay for the night of camping. Oddly enough, the BLM land had cell signal while we weren't able to get cell signal in either of the campgrounds, even with our 4G Signal Booster. After our campsite was secured, we set out to find some hikes and explore the beautiful red Aztec sandstone landscapes. One of the great things about this particular state park is that dogs are allowed on the trails. 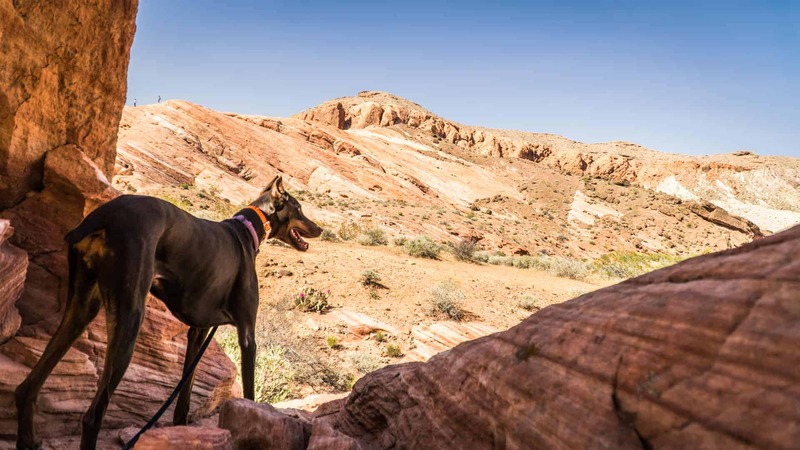 As you may know, we tend to avoid hiking for too long at National Parks because dogs are not allowed on the trails. So this was a welcomed change and Pyros certainly enjoyed getting out and stretching her legs! We brought along a collapsible dog bowl for her water. 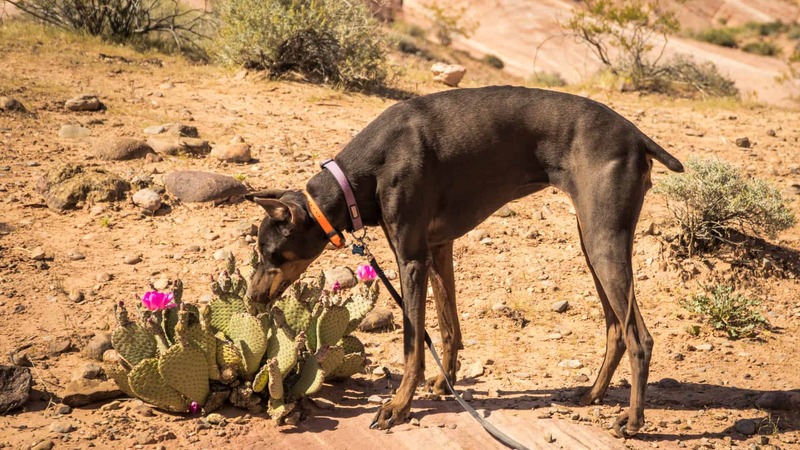 Since it was a warm day, we were worried about the sandstone heating up on her paws. After checking the ground temperature several times, we realized that the sand and sandstone was actually quite cool compared to the atmosphere. It wasn't too hot out, but keeping those paws safe is always a concern! 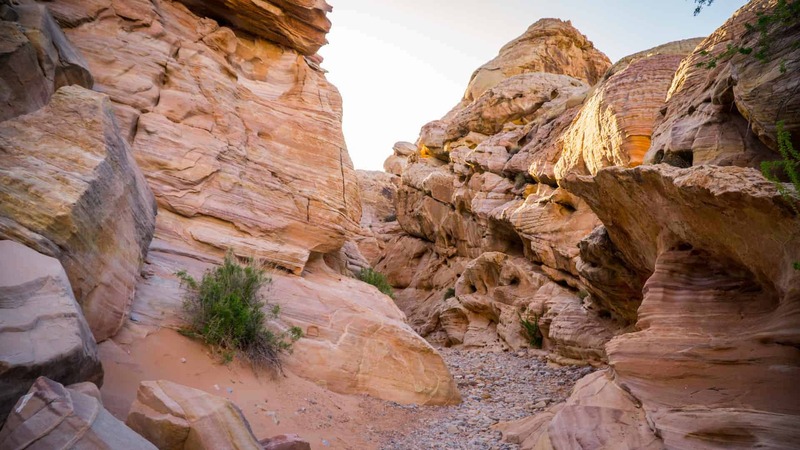 Since we only had one day to explore Valley of Fire State Park, we decided on two shorter hikes. The Fire Wave Trail was the first hike, a short mile and a half out and back trail across sand and slickrock. Once we reached the Fire Wave, we continued a bit past the namesake rock and up the hill on the other side. This viewpoint actually gave us an even better perspective of the Fire Wave, and we could actually see why it was named as such. From the backside, the formation actually looks like a wave in the ocean curling over. Our second hike for the day was White Domes Trail. This is another short hike at just over a mile. It is a loop, too, so the scenery is impressive to the last step! As you come down the trail from the parking lot, you'll soon arrive at a “ruin” of a building. It seems that many people stop and turn around at this ruin, however, it is not the end of the trail and we'd encourage you to continue the loop. You've barely gotten to the good stuff by that point! 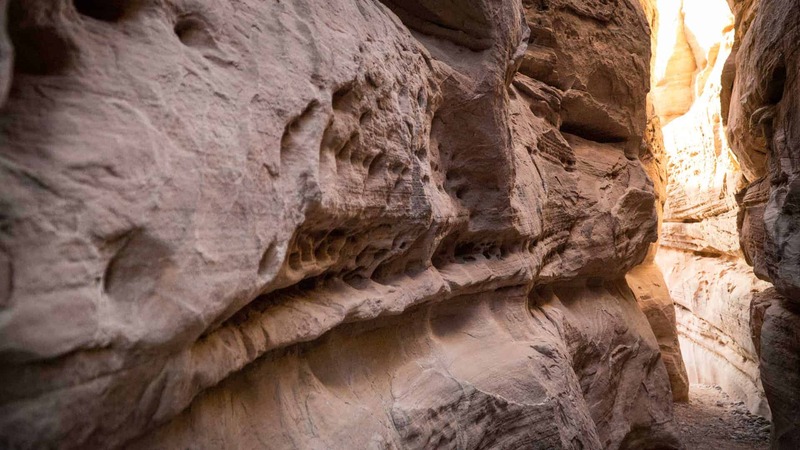 Turning down the wash past the ruin, a trail marker guides you into a narrowish slot canyon. As huge fans of slot canyons, this was a nice unexpected treat on this hike. 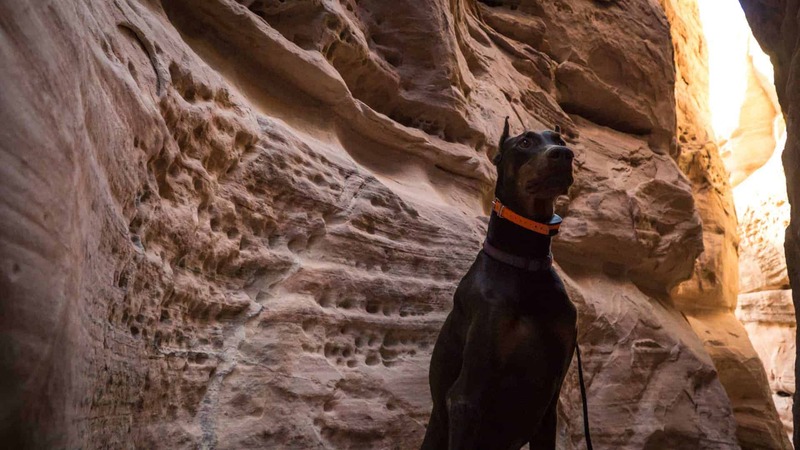 The slot canyon is pretty short, and you'll come to a wide opening on the other side. The remainder of the trail is wide open with sweeping views of the surrounding landscape. Returning to the van after hiking White Domes Trail, it was approaching sunset. While we would have loved to stay and catch a stunning sunset over the area, it is unfortunately not allowed in this state park. The park officially closes at sunset, and visitors are not to remain in the park (other than in the campgrounds) past sunset. Watching the sunset would therefore mean that we would have been out in the park after sunset, so we opted to return to the campground. We have been told that the park rangers do enforce that rule and will write tickets, so we think it's best to stick to the rules on this one.